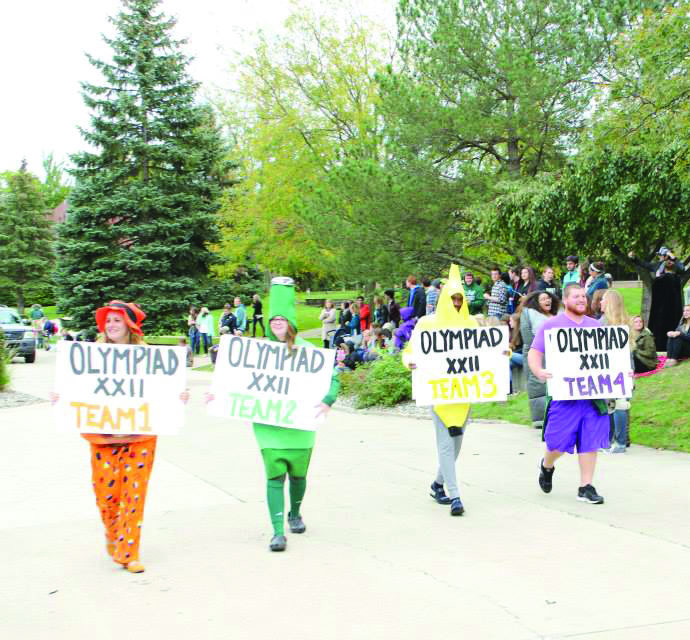 Olympiad XXII begins tonight at 7 p.m. in the PERC with the opening ceremonies. Download and print a PDF version of the infographic here. Olympiad XXII will kick off the four-day weekend of events with opening ceremonies at the PERC field house tonight at 7 p.m. The team colors this year are orange, green, yellow and purple. Many traditional Olympiad events will be returning, Hickle said, including basketball, limbo, ultimate Frisbee and synchronized swimming. New events include bubble soccer, football futbol, kickball and latest versions of video games. “There really is something for everyone,” Hickle said. Team flags will be presented today at the fieldhouse at 7:30 p.m., followed by limbo at 8 p.m., tug of war at 8:30 p.m., dodge ball at 9 p.m. and speed walking at 9:30 p.m.
Events on Friday will lead with football futbol at 5:30 p.m. at the fieldhouse, followed by five-on-five basketball at 6 p.m., table tennis and volleyball at 7 p.m. and marble drop at 7:30 p.m. The remaining events will be held at the YMCA – water polo at 8:30 p.m., aquatic spoons at 9:30 p.m. and synchronized swimming at 10:15 p.m.
Events on Saturday will lead with Dutch Blitz, Super Smash Bros and the art competition at 1:30 p.m. at the upper DC, followed by Euchre, Halo 4 and FIFA at 2:00 p.m., the spelling bee at 2:30 p.m. and Jeopardy at 3 p.m. 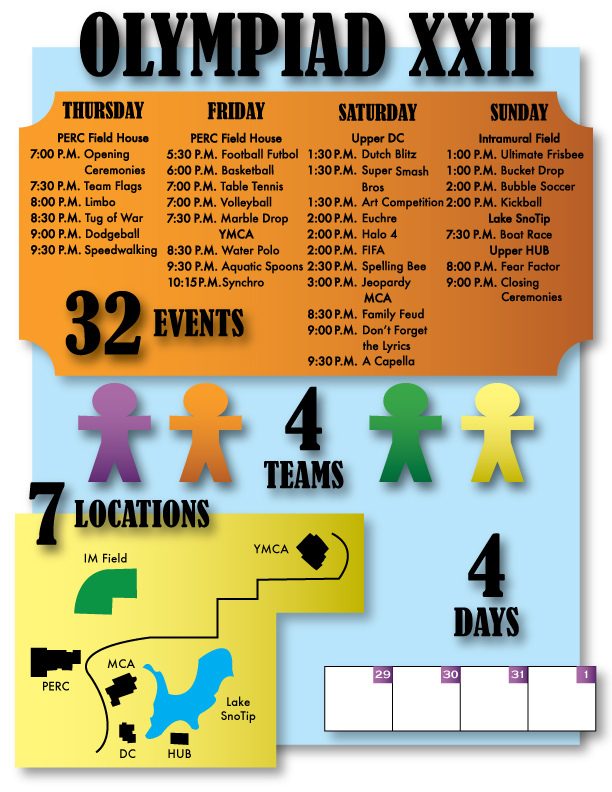 The remaining events will be held at the MCA – Family Feud at 8:30 p.m. and Don’t Forget the Lyrics at 9 p.m.
Events on Sunday will lead with ultimate Frisbee and bucket drop at 1:00 p.m. at the intramural field, followed by bubble soccer and kickball at 2:00 p.m. The boat race on Lake SnoTip will begin at 7:30 p.m. The remaining events will be held at the upper HUB – fear factor at 8:00 p.m. and closing ceremonies at 9 p.m.